It’s been a while since I last posted. I hadn’t intended to be away for so long and despite having prepared several recipes to share with you over the summer, life happened and before I knew it 2 months had gone by. It was a great summer, mostly spent in the Tuscan seaside with family. Despite the chaos that ensues when you gather loved ones from near and far, with varying food preferences and language barriers that span three continents, I wouldn’t have traded it for anything else in the world. There’s a sense of comfort in the chaos, and while we enjoyed our alone time in the Tuscan country side once we parted ways with our families, I missed it, I missed them and I still do. I never would have imagined that I would one day live thousands of miles away from my family. Having grown up in a small yet close knit family, I imagined I’d always have my regular coffee dates with my mom, our trips to the supermarket where we’d devour an entire baguette by the time we got home, and cuddling on the sofa with my niece as we watched one of her favourite movies for the 100th time. Yet now, these moments are far and few between and while we stay connected through video messaging and instant chats, nothing can replace the warmth of a hug, or in the wise words of a 9 year old “Skype is not the same, I’m going to miss touching your face”. Summer vacations may have passed quickly, but it took some time settling back in and finding our groove again. Now that we’re back to our routine, I’m back in my kitchen happily cooking, baking and experimenting. So, you’ll be seeing more of me around here with one new recipe each week, starting with these Peach Almond Squares to celebrate late summer stone fruit season. P.S. Are you looking forward to Autumn as much as I am? 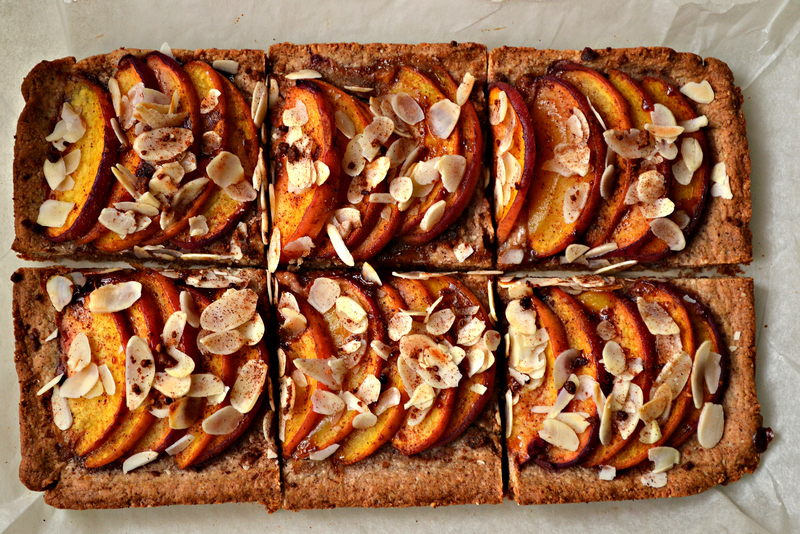 These Peach Almond Squares are made with an easy press in oat almond spelt crust that’s chewy with a crispy edge. The peaches are tossed in maple syrup and cinnamon, arranged on a partially pre-baked crust and baked to a caramelized perfection, then topped with coconut sugar, extra cinnamon and flaked almonds. They make a perfect breakfast treat or afternoon tea time snack. Preheat oven to 180 C and line an 11×7 baking dish with parchment paper. Add blanched almonds to a food processor and pulse to break them down into a coarse meal. Add rolled oats and process until you get a fine oat almond flour mixture. Transfer oat almond flour mixture to a large bowl, add in whole spelt flour, baking powder, cinnamon and vanilla. In a separate small bowl, whisk together almond butter and maple syrup, then pour it over the dry flour mixture and mix well with a rubber or wooden spatula to combine. The dough should be crumbly but should clump together nicely. Use your hands to gather together the dough and form a ball. Transfer the dough to lined baking dish and use your hands to press it in. Use a small pastry roller to smooth out the top and sides if you have one. If you don’t have a mini pastry roller you could use a small cylindrical shot glass, otherwise use your hands, it doesn’t have to be perfect and the top will get covered in peaches anyways. Bake crust on center rack at 180 C for 15 minutes. In the meantime, prepare peaches by slicing them into thin wedges and tossing them with maple syrup and cinnamon. Remove the crust from oven, but keep the oven on. Arrange peach slices on the crust, dividing the base into 6 even square sections (5 peach slices per section). Be sure to leave a small edge all around (see picture above). Return to oven and bake for 25 minutes until peaches are cooked through and slightly caramelized. Remove from oven, but keep the oven on and switch it to the broil setting. Sprinkle the peaches with coconut sugar, ground cinnamon and shaved almonds and return to oven on broil setting for 5-7 minutes until the coconut sugar has melted and the almonds have very lightly toasted. Be careful not to burn the almonds or the crust here. If your broil setting is particularly strong, you may need less than 5 minutes at this step so watch it carefully. Remove from oven and let cool before slicing into 6 equal size squares. Your words really hit home for me and I got a little teary-eyed when I read what your niece said. While I am so incredibly grateful for technology (like Skype), it’s just not the same as sitting next to the person. I can’t imagine how hard it must be to live so far from your mom. For seven years, I lived thousands of miles away from my parents and it was painfully hard and it made our visits all the more special. ❤️ But let’s talk about this recipe!!! It looks amazing!! I can’t have spelt, so I’m wondering if there’s a decent substitute?! Welcome back!! Thanks friend. It’s really hard sometimes, especially considering how close we all are and that the 4 of us all lived in the same home until I moved away…but we sure do treasure our twice a year visits, Skype chats and lots of Whatsapp time. As for the recipe, since it’s only a 1/4 cup of spelt and there’s no lift factor to worry about, I feel like it would be ok to leave out entirely and just replace it with extra oat flour, but I haven’t tried it. I’ll have to try it out to see if it works, maybe this weekend if I have time. If you try first, let me know how it turns out. So glad to see you back at blogging, Nissrine. But I also totally understand the much needed break sometimes and glimpses of your vacation on IG and what you shared about time with loved ones just sounds amazing to me. Glad you had a chance to get away and experience all that.